About the Wish Capsules from Tops Malibu: “Mail in a letter, hide anywhere – in a shoe, drawer, lunch box or in a pocket. Inspired by vials worn by carrier pigeons to relay secret messages, these metal capsules have a paper scroll hidden inside. In a tiny way they infuse intrigue, mystery, allure & romance to any occasion or simply just because. Fill a Wish Capsule with a special notes from the heart, remind yourself of hopes, dreams and wishes, creating exciting scavenger hunts, & more. 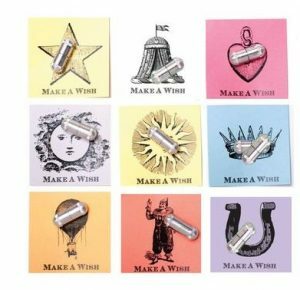 I like the vintage-inspire letterpress set of wish capsules. I think we’re going to need a bigger capsule! Find the Wish Capsules from Tops Malibu here. Lost Cowboy is powered by	WordPress 5.0.4 and delivered to you in 1.024 seconds using 40 queries.